Who doesn't love a good brownie? 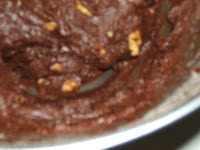 Just thinking about brownies make my mouth start to water!! I could eat brownies day and night...sometimes I do!! I don't know what it is about those little guys, but I just can't resist them. But I'm all about the gooey brownies, I don't really care for the cakey brownies. I figure if I wanted something cakey, I'd have a cake, but I don't. I want a warm, chocolaty, gooey, fudgy, scrumptious brownie!! 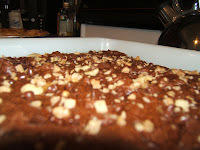 So for today's brownie craving I made a Toffee Walnut Brownie. 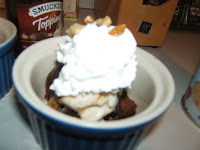 Which turned out AMAZING, but I couldn't just have a brownie, I of course had to add vanilla ice cream, hot fudge sauce, caramel and whipped cream!! YUMMY. This was also the first time I've ever made brownies with instant coffee granules, which really helped to deepen the chocolate flavor of the brownie. I've heard about doing that many times on the Food Network shows, but never tried it. And now that I have tried it I will be sure to pair coffee with chocolate more often. I can always tell when I've made a good dessert because after I've ate my piece, I'll sit back on the couch and the only thing I can think of is the rest of the brownie pan sitting in the kitchen! 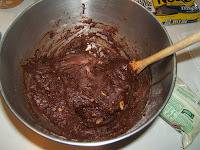 Of course it takes every ounce of strength for me to not go in there in eat the whole 9"x9" pan of brownies. But having the craving to do so lets me know that I've created, what I believe to be, a masterpiece. And that is why I love to bake...I love the satisfaction that I bring to myself, as well as others, in creating these devilish morsels!! !